Horses…it sounds so obvious. We wouldn’t have horse racing without horses. Strip away the grandstand, the clubhouse, the tote board, the rails…what does a day at the track boil down to? Whose horse gets from point A to point B faster — nothing more, nothing less. It’s easy to get caught up in everything that springs up around horse racing. 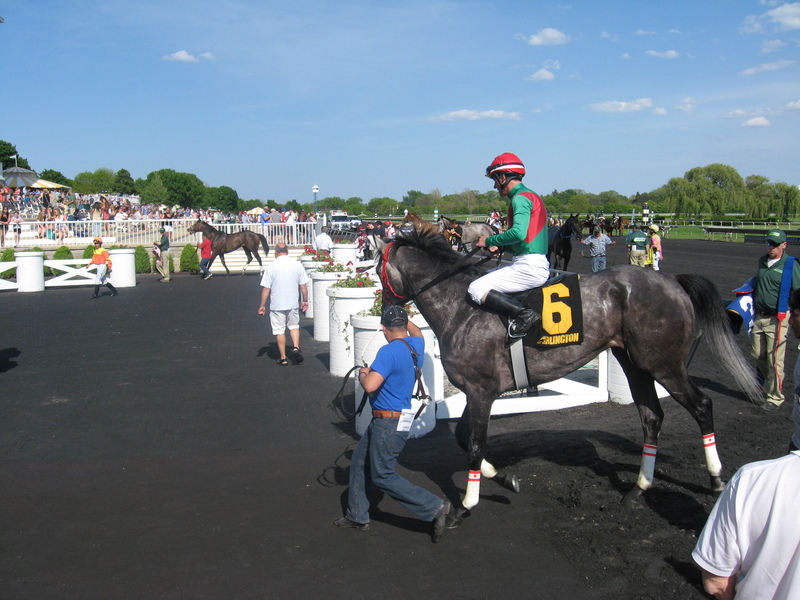 Handicapping and betting mean fun (and potentially profit) for analytical types. Seeing people at the track is satisfying for the social butterfly in all of us. However? 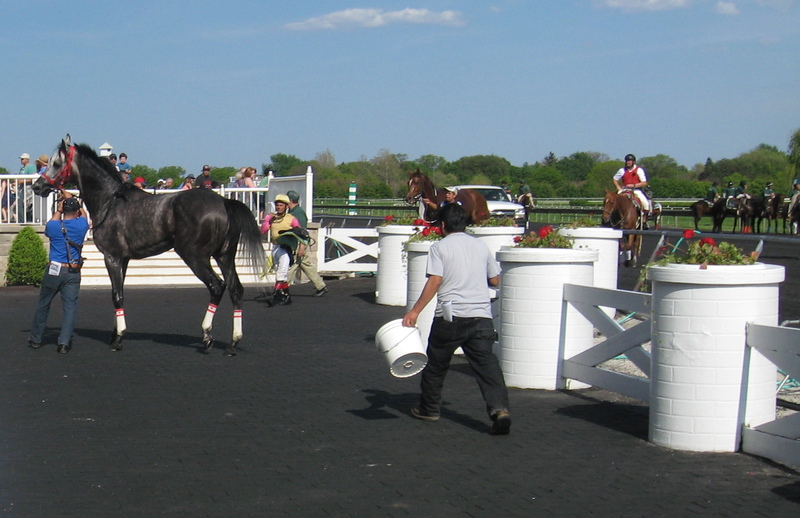 The biggest reason I started coming to the track more often is because it means seeing horses live and up close. Horses, by nature, are gorgeous creatures…though even, among all of the horses I see week in and week out, a few stand out for their beauty. This brings me to Away Westward. 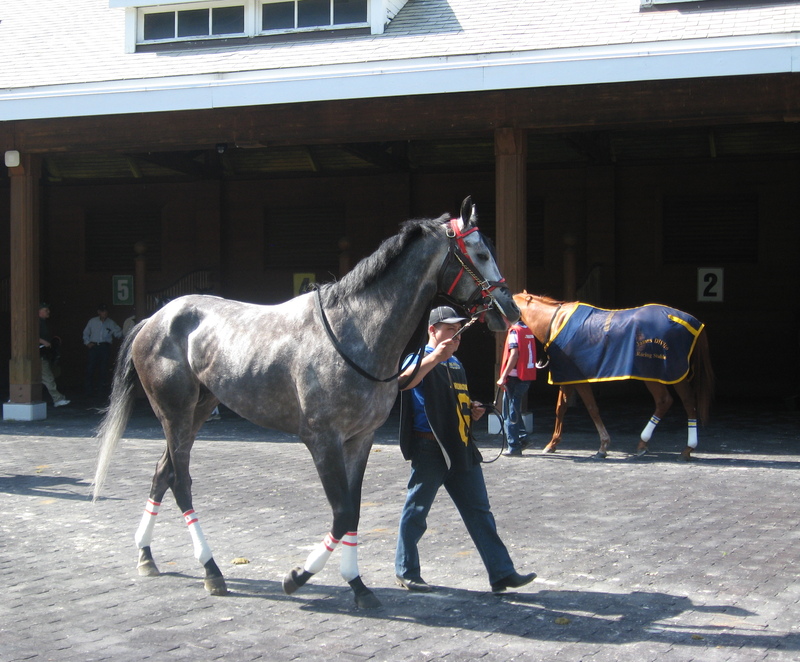 Away Westward stretches his legs in the paddock before today’s Arlington 7th. I love Away Westward. 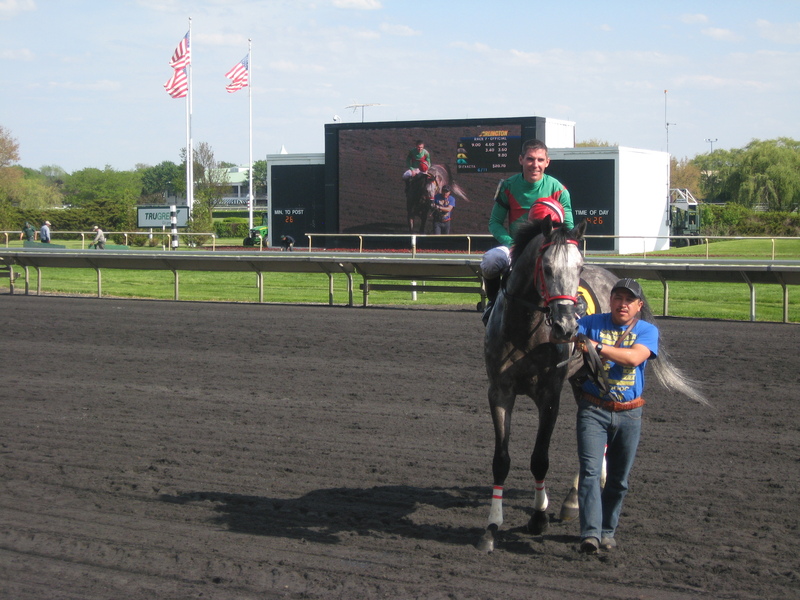 He raced at Hawthorne in January, his first race in over a year. 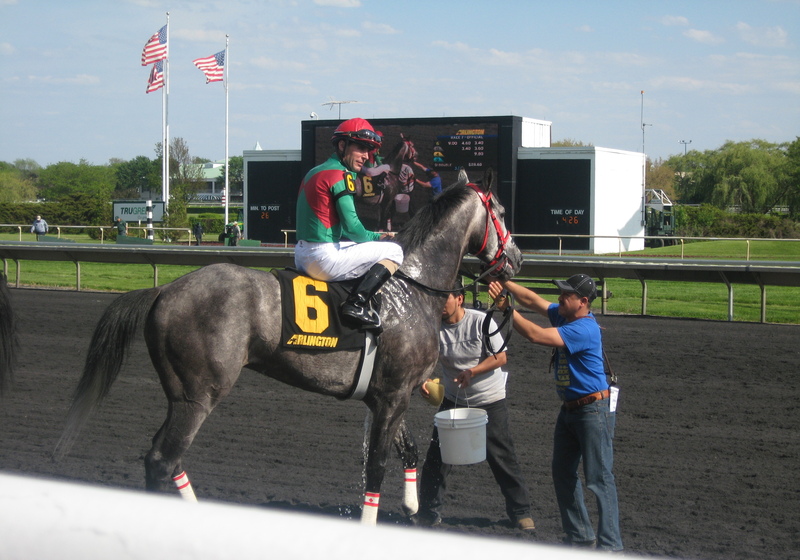 The grey son of Fort Prado, out of a fellow Illinois-bred Roaming Free, took my breath away. 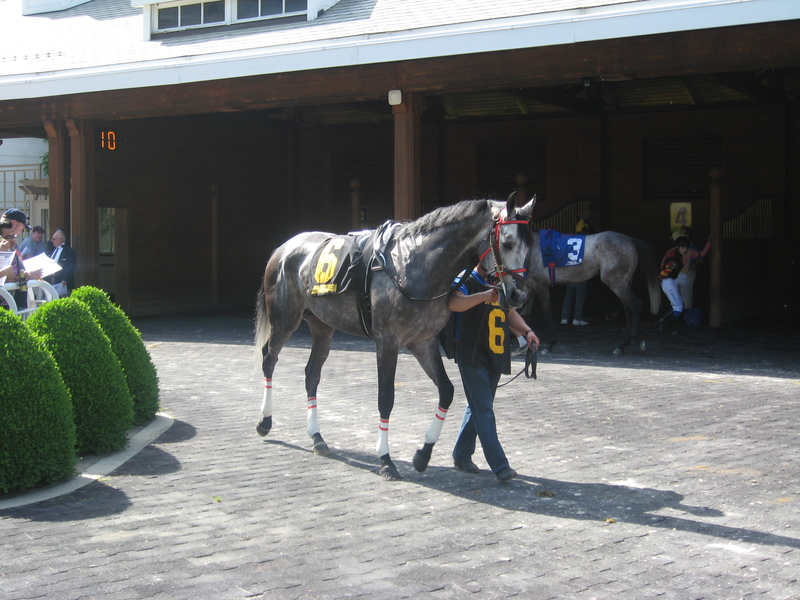 He did not race well that day, or the next, but I held out hope that he would improve when he moved back to turf. 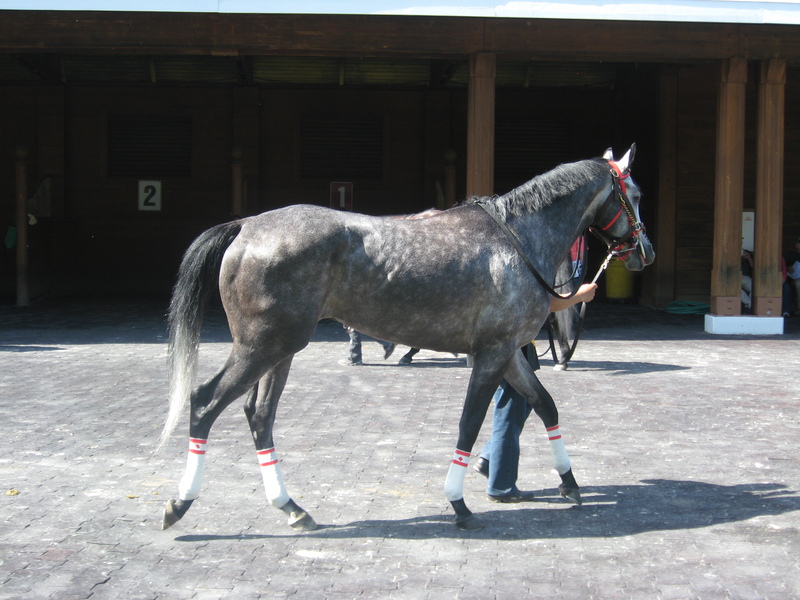 He rested until May, ran a fine third on the grass three weeks ago, and returned in a similar race today. I hoped he would win. I even thought he would win. No matter what, I was just glad to be close enough to him before the race to get a few pictures. Away Westward’s mane blows in the breeze. 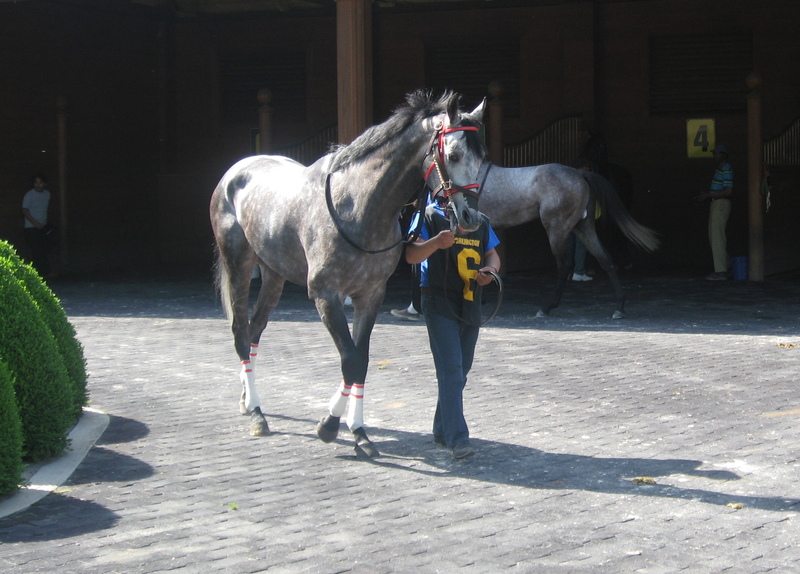 The other grey in the race, Xtra Lovin, walks behind him. Away Westward shows off his shiny coat. Away Westward, showing off those looks that made me fall hopelessly in love with him. 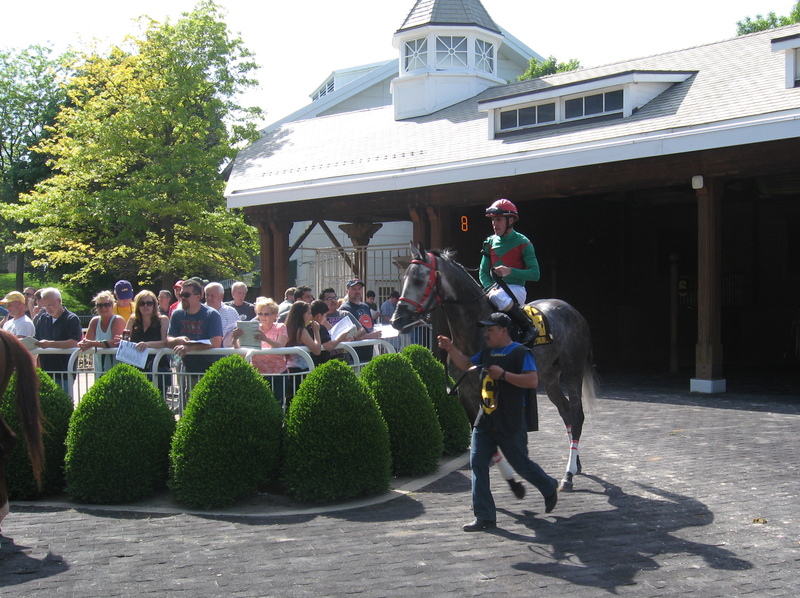 Chris Emigh aboard, Away Westward heads out to the track before his sixth start. Favoured Stand Up Guy sent, but longshot Xtra Lovin went with him early. Away Westward took his time midpack. Coming into the far turn he began a run along the rail, and had dead aim on Stand Up Guy turning for home. He angled out, passed the leader, and opened up daylight into the final furlong. Broken In came from the back of the pack and tried to make a race of it, but Away Westward had enough. 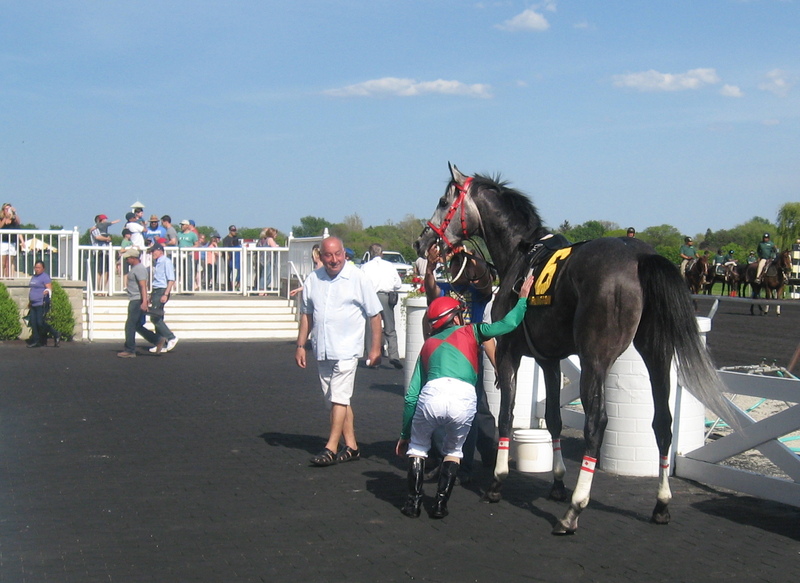 He crossed the wire half a length in front — continuing his pattern of running well on grass, and shedding that maiden label! 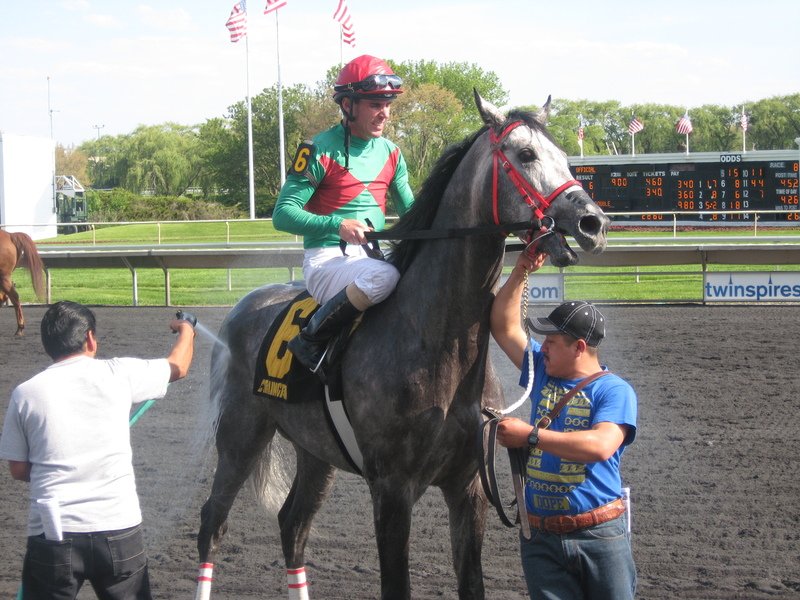 Away Westward gets a bath on the way to the winners’ circle. Who is happier here: Chris Emigh or Away Westward? Inquiring minds want to know. All clean, Away Westward goes to get his picture taken…at least, by someone a bit more official than me. Away Westward’s mane blows as Chris Emigh hops off. Goodbye, gorgeous boy. You’ve done well today.